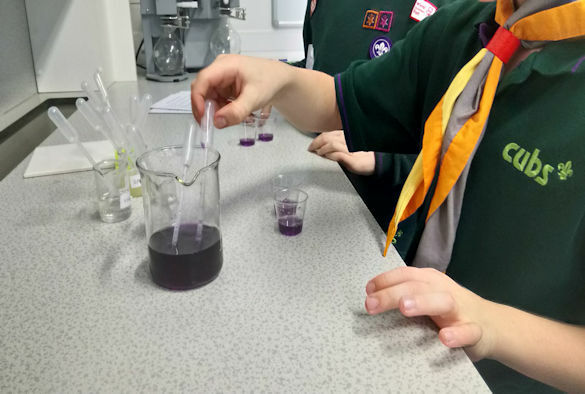 Nearly 600 Brownies, Cubs and Beavers from across Cheshire and Merseyside took part in a two-day Science Jamboree held at the University’s Central Teaching Labs (CTL). The Science Jamboree comprised a number of science related activities so that those taking part could attain their science activity (and science related) badges at the event. The Jamboree involved more than 100 volunteer undergraduate students from across the Faculty of Science and Engineering, as well as several enthusiastic archaeologists, who worked in teams to design and deliver the activity sessions specifically designed to ensure that the young people could attain their badges. Involvement in the event gave undergraduates the opportunity to gain an entry into their Higher Education Achievement Record. The student teams were mentored by 36 staff and postgraduates from across the university including professional services and even vets based at Leahurst. The activities gave participants an insight into the worlds of biology, chemistry, physics, life sciences, archaeology and engineering. Dr Helen Vaughan, a lecturer with the CTL who organised the Jamboree, said: “This was the largest event we have organised for this cohort of young people. The event was so popular that we made the decision to run two days of events this year. “Outreach teams from Environmental Science, Physics, Chemistry and Life Sciences alongside the student society Liverpool Univesity Student Scouts and Guides (LUSSAGO) came together to design and deliver this event and make it a big success. The event was attended by Merseyside Scout County Commissioner, Peter Oliver, who said: "Having has the opportunity to visit I was able to see first-hand the passion your Outreach Team volunteers have for sharing their excitement about science; and the massive interest it created in the minds of our young people. We value very highly the time and effort that goes in to planning and running these events and were delighted that you have been able to run two days this year." “The day has been fantastic, All the cubs have been so engrossed by the sessions, its been a pleasure or the leaders to see them enjoying science. “They have learnt so much in a short time that they haven’t stopped asking questions, trying to cram so much into their minds. "The kids have had lots of fun. They really enjoyed the escape room task and the water filtration was really hands on, great! Good for the kids to get to work in the labs – so exciting!" This year the project was supported by the Faculty of Science and Engineering and the Faculty of Humanities and Social Sciences.